Voters, however, would be wise to view all these candidates’ claims with skepticism. According to most experts, a governor’s power to influence his state’s economy is limited at best, especially in the short term. Governors don’t decide where oil will be discovered, whether a local company will have a big IPO or whether a major employer will close up shop. Most importantly, they don’t control national economic conditions, which can dwarf the effects of decisions made at the state level. 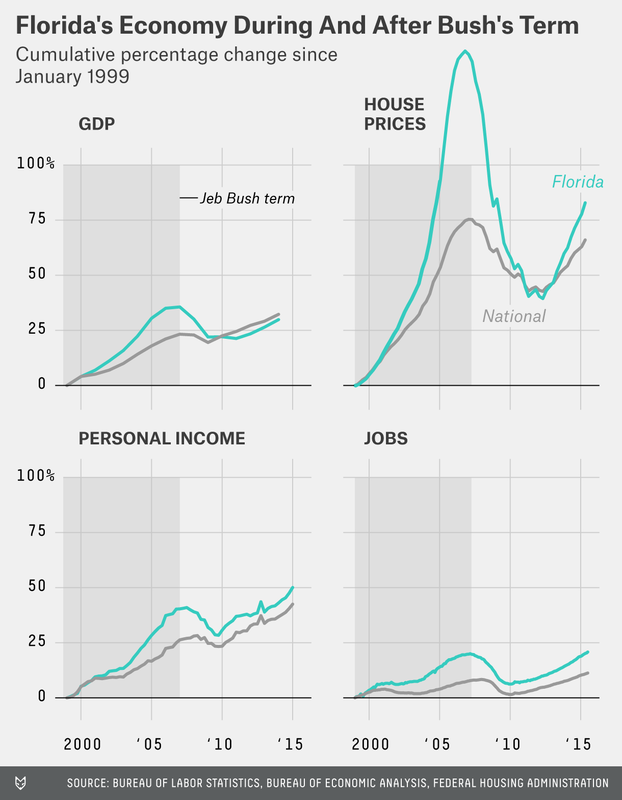 The economic numbers Bush cites aren’t distortions: He really did lead Florida during a remarkable economic boom. The state’s unemployment rate didn’t top 6 percent for his entire eight years in office, from 1999 to 2007, and it was under 4 percent for much of that time. The state gained more than a million jobs while he was in office, and household income growth far outpaced the national mark. But whatever the merits of Bush’s particular policies, his success owed a lot to timing. He ran the state amid a nationwide housing bubble that was particularly pronounced in sunny retirement meccas such as Florida, Arizona and California. Those places also suffered the most in the ensuing bust — but by then Bush was out of office. By January 2009, just two years after his term ended, Florida’s unemployment rate had soared to 9.1 percent, and the state had lost more than half a million jobs. Even today the state is dealing with the aftershocks of the recession that hit mere months after Bush handed over the keys to the governor’s mansion. Bush doesn’t deserve blame for the bust, which struck the entire country. But he doesn’t deserve much credit for the preceding boom in Florida either. And it certainly doesn’t make sense to consider his record during the boom years without also factoring in what came next. That’s true for evaluating governors in general. Most of the things governors can do to help their states’ economies — upgrading infrastructure, improving the business climate, fixing the schools — take years to bear fruit. Properly assessing their records requires looking at what happened after they left office. When Bobby Jindal was sworn in as governor of Louisiana in January 2008, the unemployment rate was 4.3 percent. That turned out to be the best mark of his term so far: After more than seven and a half years of Jindal’s leadership, Louisiana’s unemployment rate now stands at 6.2 percent. Of course, the above paragraph leaves out a crucial piece of context: the nationwide recession, which was just beginning when Jindal took office. It’s no surprise that Louisiana’s economy took a turn for the worse in 2008; the whole country’s did. Similarly, Scott Walker doesn’t deserve much credit for Wisconsin’s unemployment rate falling on his watch: He took over in January 2011, after the recession was over, and has been in office for the strongest years of the recovery. 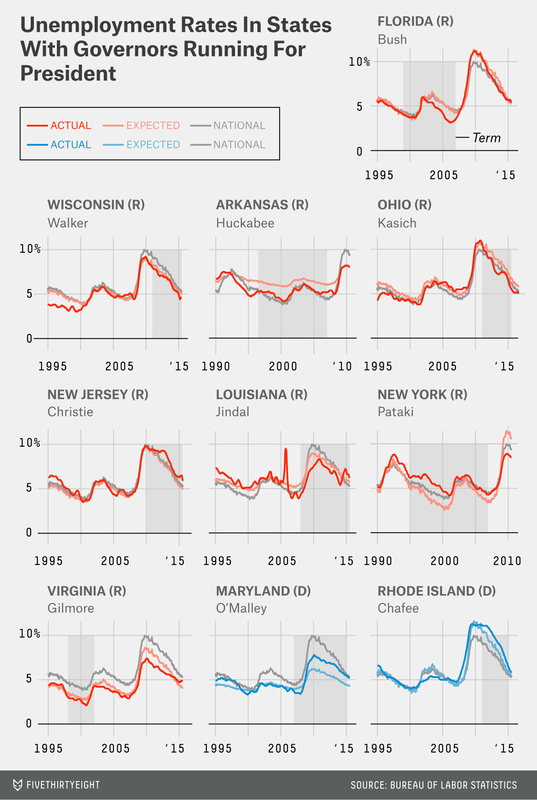 The charts below show this comparison for all 10 governors running for president. To be clear, they still don’t tell us anything about whether governors were responsible for their states’ economic performance. And they can’t account for special circumstances — an oil boom in Ohio or a hurricane in New Jersey, for example — or even for more gradual shifts in how a given state’s economy differs from the country’s as a whole. But at least they give a sense of whether their states have done better or worse than expected based on national trends. Governors love to brag about how they balanced their states’ budgets. They’re counting on voters not realizing that, unlike the federal government, virtually all states are required — either by law or by their constitutions — to have balanced budgets. When Bush boasts that he balanced Florida’s budget “eight years in a row,” that really just means he spent eight years in office. That doesn’t mean, however, that voters can’t dig a bit deeper into governors’ fiscal stewardship. Did the governor dip into a rainy-day fund to pay for normal expenses? Agree to expensive union contracts that will create fiscal headaches down the road? Make unrealistic assumptions about investment returns in order to make the state pension system look healthier than it really is? Those are signs that a governor has been fiscally irresponsible, even if the budget is nominally balanced. Context matters here too, of course. New Jersey Gov. Chris Christie, for example, took over a state that had serious fiscal problems even before the recession led to a sharp drop in tax revenue. When he took office in 2010, Christie inherited both a $2.2 billion immediate budget shortfall and an even larger “structural deficit” based on longer-run tax and spending plans. None of that was his fault. It is fair, however, to judge how Christie has managed the challenges. Rather than raise taxes or make big spending cuts, he has made up budget shortfalls in part via one-time fixes and by skipping payments to the state pension system — reneging on an earlier agreement and sparking a prolonged court battle. According to New Jersey’s nonpartisan Office of Legislative Services, the state’s structural deficit is nearly as big as it was when Christie took office, and the state’s bond rating has been downgraded repeatedly on his watch. When governors talk about the economy on the campaign trail, they often point to the kind of macroeconomic indicators that are already familiar to voters — job growth, the unemployment rate and personal income, among others. But in evaluating their records, it probably makes sense to focus on what they can actually control: the state budget. Governors get to propose the budget and, especially if their party controls the state legislature, have significant influence over how taxpayers’ money is spent. John Kasich, for example, has overseen Ohio during a strong economic recovery. Whether or not he deserves much credit for that resurgence — which has come amid both the national recovery and a major oil boom — it has given Kasich much more money to spend. He has boosted education spending, created an earned income tax credit to help low-income workers and cut taxes by billions of dollars. Unlike most Republican governors, he also chose to expand Medicaid under the Affordable Care Act; the federal government is covering the extra cost now, but the state will have to pick up part of the bill in the future. The libertarian Cato Institute has criticized Kasich for increasing spending from the general fund 18 percent during his term; Kasich says overall spending grew by less than that. It’s important to look not just at how much governors increase spending or cut taxes, but how they do it. Kasich described his school-funding plan as an effort to boost spending in low-income districts, but an independent analysis of the plan by NPR found that in many cases it would do the opposite. (The state legislature ultimately rejected Kasich’s plan, and he used his line-item veto to cut funding from the version lawmakers passed instead.) His tax cuts have gone mostly to the wealthy and to businesses; he has proposed phasing out Ohio’s progressive income tax and raising the sales tax, which tends to hit poorer households harder since they spend a larger share of their income. Whether the details of Kasich’s plans make him more or less attractive is a matter of political philosophy — his tax plan has won praise from some conservative economists who think it will boost economic growth, while it has been criticized by progressives as favoring the rich over the poor. But evaluating his actual record on taxes and spending makes much more sense than focusing on how many jobs were created while he was in office. Bush, Scott Walker, John Kasich, Chris Christie, Bobby Jindal, George Pataki, Mike Huckabee and Jim Gilmore. This is, intentionally, the simplest of models: It uses a linear regression to determine the historical relationship between a state’s unemployment rate and the national rate. For each state, the model is calibrated based on the 10 years before the governor in question took office. The one exception is Louisiana, where the sharp spike in unemployment after Hurricane Katrina is a clear outlier; I excluded September through November of 2005 from the model.